During the nights of 25 and 26 May, the camera of the ASTRI telescope prototype (pictured to the left) recorded its first ever Cherenkov light while undergoing testing at the astronomical site of Serra La Nave (Mount Etna) in Sicily managed by INAF-Catania. This comes not long after its optical validation was achieved in November 2016 (read story here). This accomplishment was the first optical demonstration for astronomical telescopes using the novel Schwarzschild Couder dual-mirror design. The ASTRI telescope is a proposed Small-Sized Telescope design for the Cherenkov Telescope Array (CTA). Although the camera was not fully configured, the ASTRI team was still able to capture its first Cherenkov light and produce beautiful images of the showers generated by cosmic rays in the Earth’s atmosphere. The image below shows one of the events captured by the team. This information will allow scientists to reconstruct the direction of gamma-ray photons emitted from celestial sources (indicated by the yellow line on the image on the left). The camera is based on novel SiPM small pixel sensors (7 mm x 7 mm) and CITIROC ASICS peak-finder front-end electronics. The camera was specifically designed to fit on the dual mirror ASTRI telescopes for covering a large field of view of 10O x 10O. “The results gathered from the images are very much in line with the performance expectations established in the lab, proving the functionality of the camera for the ASTRI telescopes,” said Osvaldo Catalano, astronomer at the INAF-Palermo Institute and leader of the ASTRI camera development program. 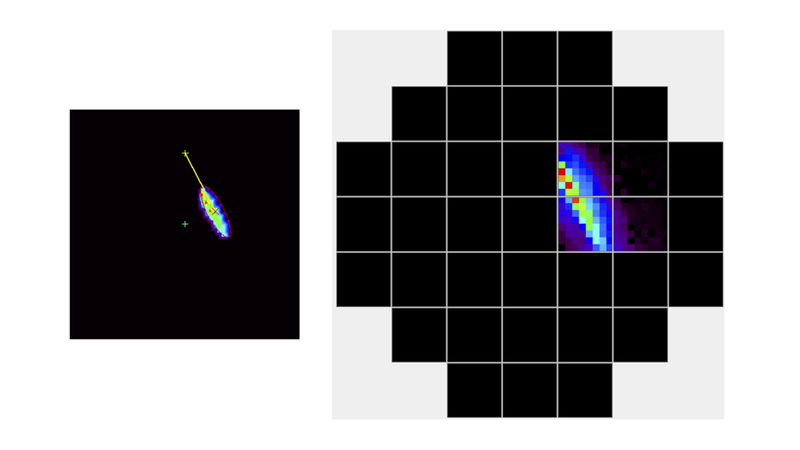 “The ASTRI team’s achievement is an important milestone and a big step toward the pre-production phase of ASTRI and CTA,” said Giovanni Pareschi, astronomer at the INAF-Milano and principal investigator of the ASTRI project. Three classes of telescope types are required to cover the full CTA very-high energy range (20 GeV to 300 TeV): Medium-Sized Telescopes (12 m diameter dish) will cover CTA’s core energy range (100 GeV to 10 TeV) while the Large-Sized Telescopes (23 m) and Small-Sized Telescopes (4 m) or SSTs are planned to extend the energy range below 100 GeV and above a few TeV, respectively. The ASTRI telescope is one of three proposed SST designs being prototyped and tested for CTA’s southern hemisphere array. 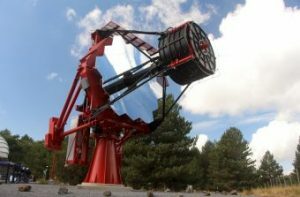 It uses an innovative dual-mirror Schwarzschild-Couder configuration with a 4.3 m diameter primary mirror and a 1.8 m monolithic secondary mirror. The ASTRI project (http://www.brera.inaf.it/astri/) is led by the Italian National Institute of Astrophysics (INAF) with the collaboration of a number of Italian universities, the Italian National Institute of Nuclear Physics (INFN), Universidade de São Paulo in Brazil and North-West University in South Africa. The SSTs will outnumber all the other telescopes with 70 planned to be spread out over several square kilometres in the southern hemisphere array. Since the showers generated by very high-energy gamma-rays (between a few TeV and 300 TeV) produce a large amount of Cherenkov light, it is sufficient to build telescopes with small mirrors to catch that light. The SSTs’ wide coverage and large number, spread over a large area, will improve CTA’s ability to detect the highest energy gamma rays. The ASTRI SST-2M Prototype: Camera and Electronics, Proceedings of the 33rd International Cosmic Ray Conference (ICRC 2013), Rio de Janeiro (Brazil). Dedication: We would like to dedicate this achievement to the memory of our close colleague and friend, Prof. Giovanni (Nanni) Bignami (1944-2017). In addition to his numerous accolades and contributions to the field of gamma-ray astronomy, he was a crucial supporter and contributor to CTA and the ASTRI program, for which he invented the acronym. We are so grateful for his unwavering encouragement and insight, and we offer our sincerest condolences to his wife, Patrizia Caraveo, his family, colleagues and friends.